Sometimes you need a fun lunch but also something that is simple. My family had a really busy weekend. Between work stuff, helping with a community event, and family, it didn't leave much time or energy to figure out a complicated lunch. I'm sure many of you can relate. 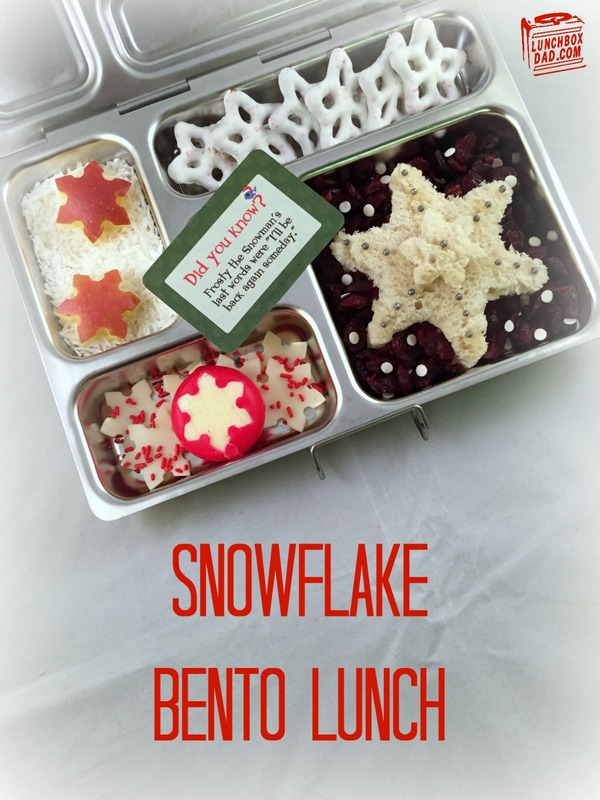 Since it is almost Christmas, I figured why not do a snowflake lunch? All you need are two different sizes of snowflake cookie cutters to make it work. I made this lunch in a Planetbox lunchbox with a Lunchbox Love Note for a finishing touch. Please make sure and follow me on Facebook, Twitter, Pinterest, Instagram, and YouTube! I share so much more stuff on there that you won't want to miss. 1. Use larger cookie cutter to cut out two snowflakes. Spread peanut butter and jam to make a sandwich. Cut out smaller snowflake and paste on top using a dab of peanut butter. Place in main dish. 2. 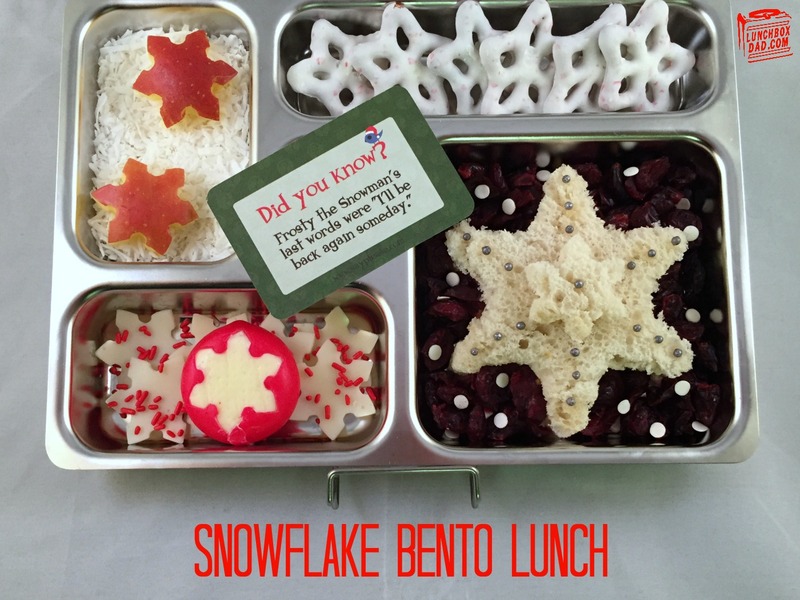 Decorate snowflakes with a few silver sprinkles. I used a toothpick and honey to glue them on. It only takes a minute. 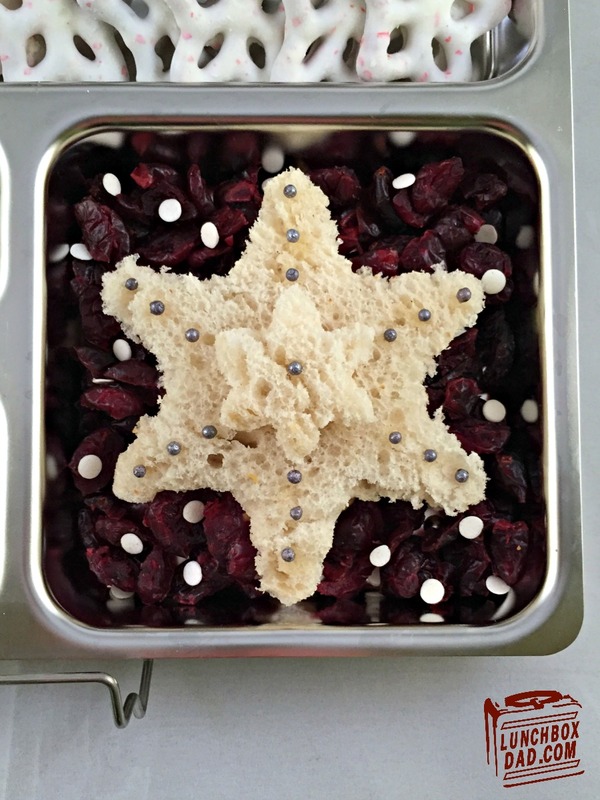 Surround snowflake with dried cranberries. 3. Use small snowflake cutter on white cheese to make several cutouts. It also works to cut the wax on Babybel cheese rounds. Use a small amount of pressure to press down on red top to cut through wax. Carefully peel the wax piece out. Arrange cheese cutouts in side dish and place Babybel on top. 4. In another side dish sprinkle shredded coconut. Cut a few more snowflakes out, this time make them out of apple. Place apples on top of coconut. In another dish put yogurt covered pretzels. 5. Drop Christmas themed sprinkles around where desired. Finish off with a Lunchbox Love Note if you have them. Very cute! Where did you get the pretzels? Do they have peppermint in them? Thanks Christeen. I got the pretzels at my local grocery store. Some major brand made them, I forget who. Yep they have peppermint in them. Thank you! I will be on the hunt for them. My daughter would love them. No problem, hope you find them!